Joystiq posted an article today about the shortage for the World Ends With You for Nintendo DS. The article says the game has been in short supply for quite a while but Square Enix has shipped the game to retailers and is in stock now. I thought this would be an interesting game to check on to see how severe the shortage has been and if the restock lowers the resale price. 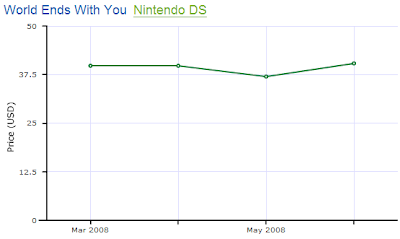 The chart below shows that World Ends With You has been selling at retail price since it's release. The game must be relatively hard to find because most games start dropping in price right after they are released. The resale price also increased a little in June to be above retail, about $40.36 when retail price is $39.99. The current price on vgpc is $36.00 so the game has come down almost $4 already from retail price. If Joystiq is right and the game has been restocked at most retailers, I expect the price will keep coming down in the next couple of days. Yes, I've noticed this too and have been keeping my eye on it on eBay. It never really peaked much above retail, though, unless you count Amazon, where it was $55-$60 for about 3 weeks. Amazon *just* got it back in stock today, so things should settle back down. Amusingly enough, Amazon had it pretty cheap at $29.99 before they went out of stock last month. Speaking of games that may very well be quite expensive some day because of a low shipment to retailers, take a look at LOL for the DS. It is only released online by the game's website. IGN reviewed it and it looks like it could be a similar situation as The World Ends with You in a month or so. I had never heard of LOL until now. Thanks for that bit of info. They don't have a UPC so it might be hard to track the prices fully, but I will add that one to the database so we can see what it does. I'm sure it will be rare and it looks like it is a decent game according to IGN.